Online registration is open for October series till class start. Be sure to sign up while discount pricing is in effect. Live music returns next week with the Don Neely Swingtet. 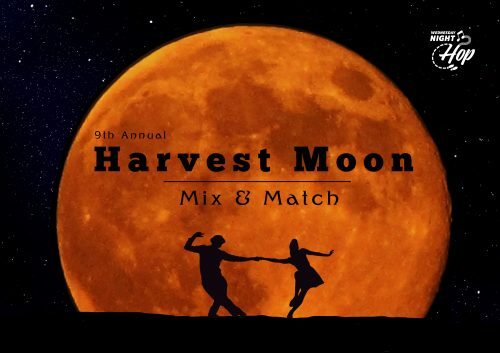 Our 9th annual Harvest Moon Mix & Match Derby is almost here! Make a resolution to compete this year in our friendly, supportive, and cheerful environment. Mini-Privates: A new fun learning experience at Wednesday Night Hop! Are you craving one-on-one instruction, but the idea of signing up for a private lesson is too daunting? Now you can try our mini-private format, in the comfort of WNH’s time and space. On most fourth (and fifth, when available) Wednesdays of the month, we’ll hold mini-private sessions with various WNH instructors, both for Lindy Hop and Balboa. The mini-privates run from 10pm to 11pm, and are 15 minutes each, for $15. Sign up at the front desk. We hope to see you for the mini-privates this week!